There’s a lot of great research on names and I’ve been a big fan of it for years, although it’s hard to commensurate with my own favorite diffusion models since names are a flow whereas the stuff I’m interested in generally concern diffusion across a finite population. To tell if there was any evidence for this story I checked the Social Security data, but the web searchable interface only includes the top 1000 names per year. Thus checking on very rare names requires downloading the raw text files. There’s one file per year, but you can efficiently search all of them from the command line by going to the directory where you unzipped the archive and grepping. This despite the fact that I personally know an American named Reihan. (Actually I’ve never asked him to show me a photo ID so I should remain open to the possibility that “Reihan Salam” is just a memorable nom de plume and his birth certificate really says “Jason Miller” or “Brian Davis”). For names that do meet the minimal threshold though you can use grep as the basis for a quick and dirty time series. To automate this I wrote a little Stata script to do this called grepnames. To call it, you give it two arguments, the (case-sensitive) name you’re looking for and the directory where you put the name files. 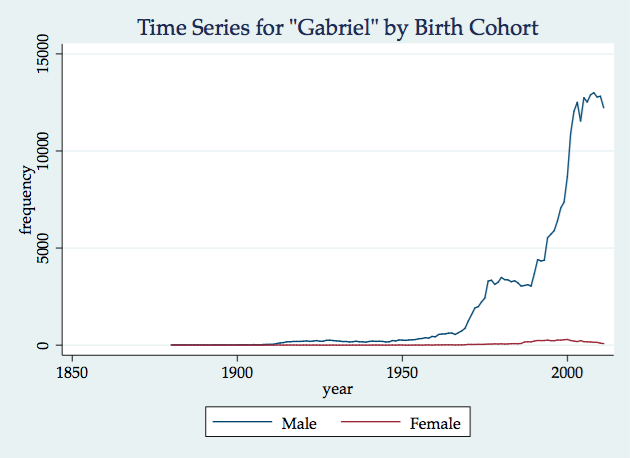 It gives you back a time-series for how many births had that name. Note that these numbers are not scaled for the size of the cohorts, either in reality or as observed by the Social Security administration. 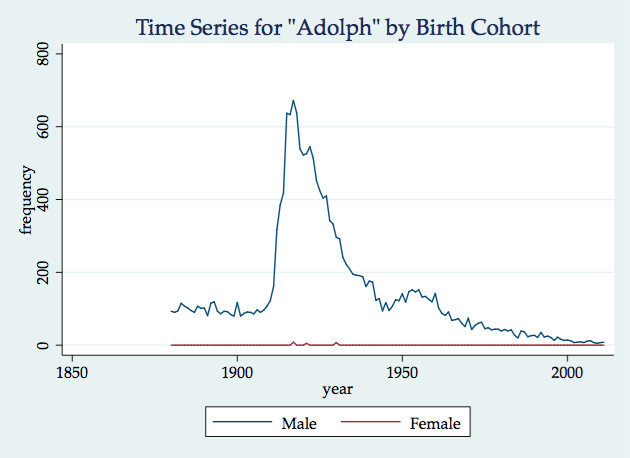 (Their data is noticeably worse for cohorts prior to about 1920). Still, it’s pretty obvious that my first name has grown more popular over time. We can also replicate a classic example from Lieberson of a name that became less popular over time, for rather obvious reasons. Next time, how diverse are names over time with thoughts on entropy indices. (Also see Jay’s thoughts on names, as well as taking inspiration from my book to apply Bass models to film box office). * Yes, I know that one of those stories is true but the interesting thing is that people like to retell it (and do so with mocking commentary), not that the underlying incident is true. It is also true that yesterday I had eggs and coffee for breakfast, but nobody is likely to forward an e-mail to their friends repeating that particular banal but accurate nugget. As someone who mostly works with text files with a lot of strings, I often run into trouble with the Stata insheet command being extremely finicky about how it takes data. Frequently it ends up throwing out half the rows because at some point in the file there’s a stray character and Stata not only throws out that row but everything thereafter. In my recent work on IMDb I’ve gotten into the habit of first reading text files into Excel, then having Stata read the xlsx files. This is tolerable if you’re dealing with a relatively small number of files that you’re only importing once, but it won’t scale to repeated imports or a large number of files. More recently, I’ve been dealing with data collected with the R library twitteR. Since tweets sometimes contain literal quotes, twitteR escapes them with a backslash. However Stata does not recognize this convention and it chokes on this when the quote characters are unbalanced. I realized this the other night when I was trying to test for left-censorship and fixed it using the batch find/replace in TextWrangler. Of course this is not scriptable and so I was contemplating taking the plunge into Perl when the Modeled Behavior hive mind suggested the Stata command filefilter. Using this command I can replace the escaped literal quotes (which chokes Stata’s insheet) with literal apostrophes (which Stata’s insheet can handle). Problem solved, natively in Stata, and I have about 25% more observations. Thanks guys. An extremely common estimation strategy, which Roland Fryer calls “name that residual,” is to throw controls at an effect then say whatever effect remains net of the controls is the effect. Typically as you introduce controls the effect goes down, but not all the way down to zero. Here’s an example using simulated data where we do a regression of y (continuous) on x (dummy) with and without control (continuous and negatively associated with x). So as is typical, we see that even if you allow that x=1 tends to be associated with low values for control, you still see an x penalty. However this is a spurious finding since by assumption of the simulation there is no actual net effect of x on y, but only an effect mediated through the control. This raises the question of what it means to have controlled for something. Typically we’re not really controlling for something perfectly, but only for a single part of a bundle of related concepts (or if you prefer, a noisy indicator of a latent variable). For instance when we say we’ve controlled for “human capital” the model specification might only really have self-reported highest degree attained. This leaves out both other aspects of formal education (eg, GPA, major, institution quality) and other forms of HC (eg, g and time preference). These related concepts will be correlated with the observed form of the control, but not perfectly. Indeed it can even work if we don’t have “omitted variable bias” but just measurement error on a single variable, as is the assumption of this simulation. To get back to the simulation, let’s appreciate that the “control” is really the control as observed. If we could perfectly specify the control variable, the main effect might go down all the way to zero. In fact in the simulation that’s exactly what happens. That is, when we specify the control with error much of the x penalty persists. However when we specify the control without error the net effect of x disappears entirely. Unfortunately in reality we don’t have the option of measuring something perfectly and so all we can do is be cautious about whether a better specification would further cram down the main effect we’re trying to measure. Unfortunately such graphs can be difficult to script. This is especially so for the legends, which by default show the variable name rather than the selection criteria. I handle this by recursively looping over a local, which in the case of the legend involves embedded quote marks. local command "`command' (kdensity `var' if year==`i')"
disp "twoway ""`command'" ", legend:" "`legend'"
After hearing from two friends in a single day who are still on Stata 10 that they were having trouble opening Stata 12 .dta files, I rewrote my importspss.ado script to translate Stata files into an older format, by default Stata 9. I’ve tested this with Stata 12 and in theory it should work with older versions, but please post positive or negative results in the comments. Remember that you need to have R installed. Anyway, I would recommend handling the backwards compatibility issue on the sender’s side with the native “saveold” command, but this should work in a pinch if for some reason you can’t impose on the sender to fix it and you need to fix it on the recipient’s end. Be especially careful if the dataset includes formats that Stata’s been updating a lot lately (e.g., the date formats). * that is, use it when your collaborator forgot to use "saveold"
Now that I’ve been looking into setting my graphs in a serif font instead of the default Arial, I find that changing fonts in Stata graphs is surprisingly difficult. It’s not that it’s intrinsically difficult, just confusing to learn because Stata’s handling of fonts breaks with the general Stata convention of specifying options as part of a command and is instead more similar to the Gnuplot style of changing device preferences then executing a command targeting the device. One implication of this is that there’s no option to change the graph font in the graph GUI interface (which is how I usually learn new bits of command-line syntax). One of the oddities is that there is no set of PDF options. Rather (at least on a Mac) you control the PDF device as part of the display device (“window”). My understanding is that Stata for Mac relies on the low level OS X PDF support for creating PDFs, and this would explain why it considers PDF to be part of the display device rather than one of the file type devices (as well as why it won’t make PDFs if you suppress screen rendering, why Stata for Mac got PDF support earlier than the other platforms, and why the PDFs looked like this until they fixed it in 11.2 and 12). Note that this means that your PDF will use the EPS fonts if you use my graphexportpdf.ado script and the display fonts if you use the base “graph export foo.pdf” syntax. I haven’t checked, but I wouldn’t be surprised if the PDF preferences in Stata for Windows are controlled by the EPS preferences rather than the display preferences. In any case, I recommend just setting all devices the same so it won’t matter. (Thanks to Eric Booth, whose StataList post, helped me figure this out).